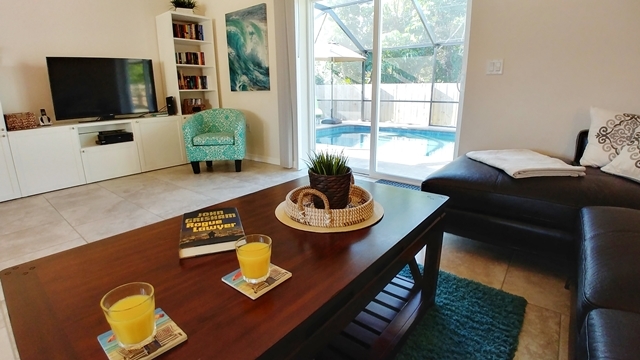 You are looking for a vacation home in Venice Florida, with a private pool and near the beach? 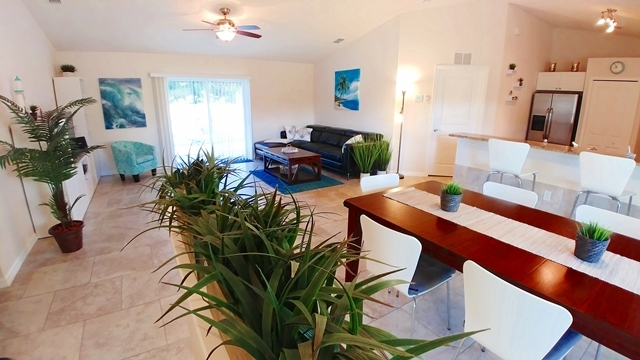 Our Villa Happy Gator at Florida’s beautiful Gulf Coast with heated pool and only 10 minutes from the beaches offers 3 bedrooms and 2 bathrooms, making it ideal for couples, friends or the whole family. 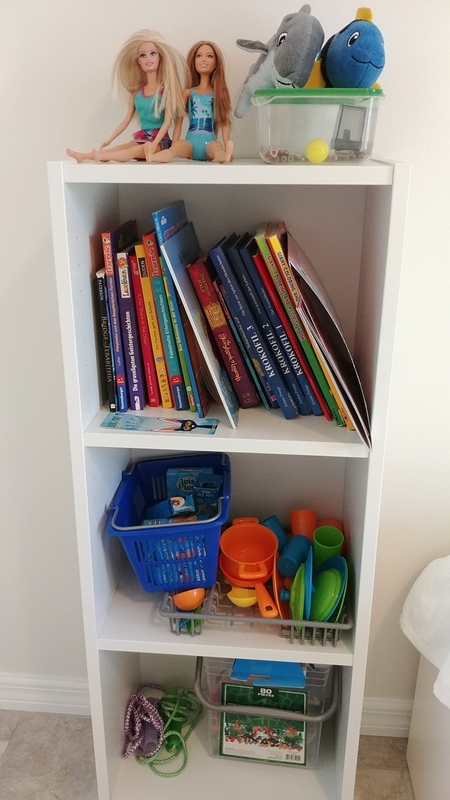 Our child-friendly vacation home is set for little guests. 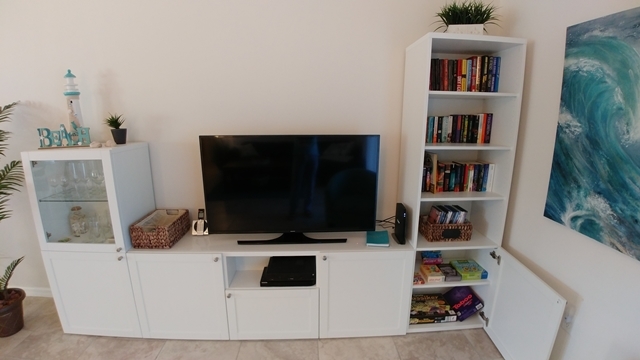 Bikes, internet and WiFi, games, beach utensils and a competent and attentive property management indeed guarantee a perfect vacation experience. Florida experts specifically appreciate the sunny southwestern exposure as much as the peaceful privacy. Welcome to your „Home away from Home“! Immediately after entering you feel comfortable – the spacious living / dining area with adjoining open kitchen and breakfast bar, the high ceilings, friendly colors and the modern decor are appealing and inviting. Even more the entire house is tiled and is fresh and clean. 3 bedrooms are at your disposal, the beds have high quality and comfortable mattresses. 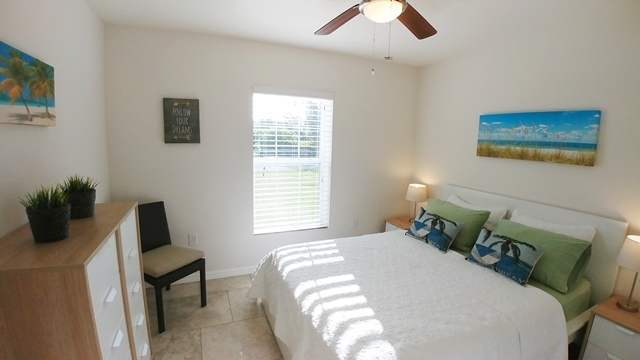 The spacious master bedroom with its ensuite bathroom and walk-in closet features a comfortable king size bed. There is also a desk for your private mail or your notebook. 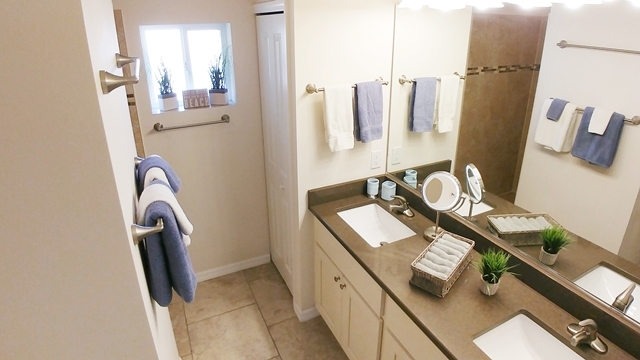 The bright and spacious master bathroom with the large double vanity offers enough room for two. For your convenience we have installed a hand held shower head. 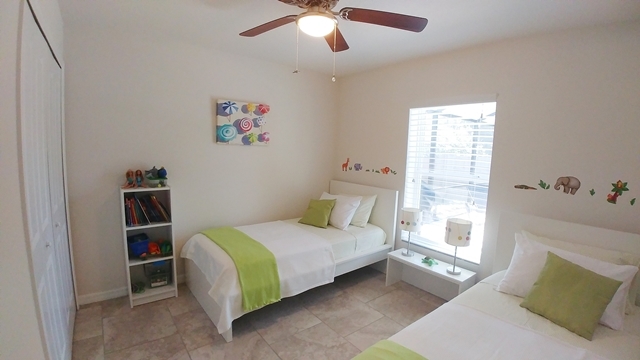 The other two bedrooms, located on the opposite side of the living room, are furnished with a queen-size bed and 2 single beds – ideal for kids. All beds come with American beddings – but duvets and duvet covers are also available for friends of the European bedding style. 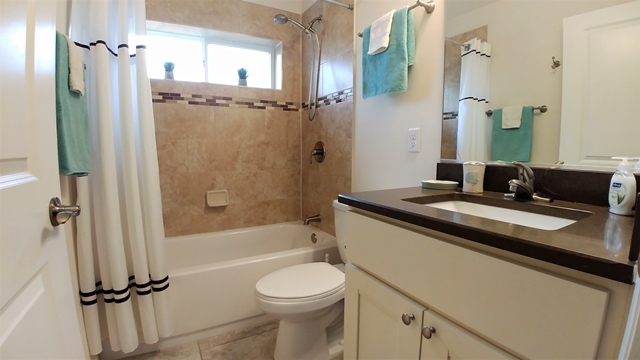 Both bedrooms share a second bathroom with bathtub. The daylight window and the handheld shower head add additional comfort. 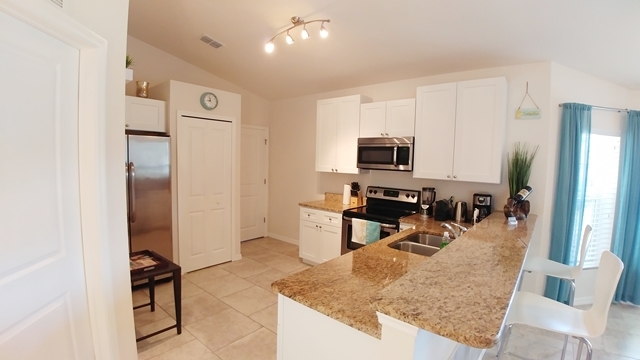 The open American kitchen with breakfast bar is equipped with everything you need for a relaxing stay. Of course there is a large fridge with ice maker, a much loved feature. Important for coffee lovers: A Nespresso coffee machine is also provided! Spend an enjoyable evening in front of our Smart TV. With our First Class package you can receive more than 200 channels, many of them in HD quality. Additionally there is also a selection of DVDs and Blu-rays you can watchwith the region-free Blu-ray player. 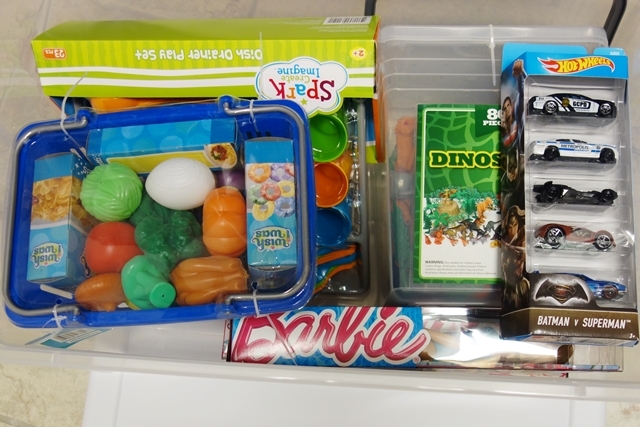 All sorts of games and a large number of books in German and English ensure that no boredom arises. Of course, you will have free Wi-Fi for your mobile devices. Furthermore calls within the US and Canada are free with our phone. The great pool area is certainly one of our highlights. The oversized pool deck provides a lounge area, a large dining table for 6, sun chaises and parasols and a barbecue grill. The sunshelf and the excellent water quality – thanks to modern technology without the addition of chlorine – complete the perfect pool experience. You like to be active? With our bicycles, you can explore the great bike trail system of Venice. 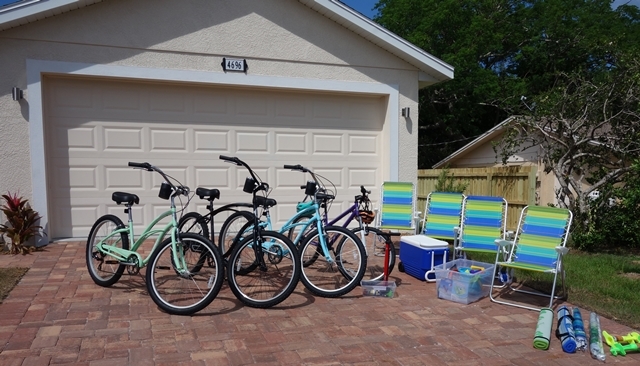 For larger families we can arrange a bike rental for a reasonable price. We provide beach utensils for your beach visit: beach chairs, umbrellas, beach mats, games and sand toys as well as coolers. 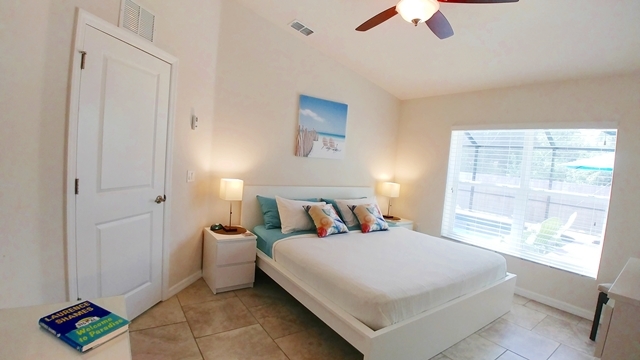 Family Friendly Vacation Home in Venice Florida! 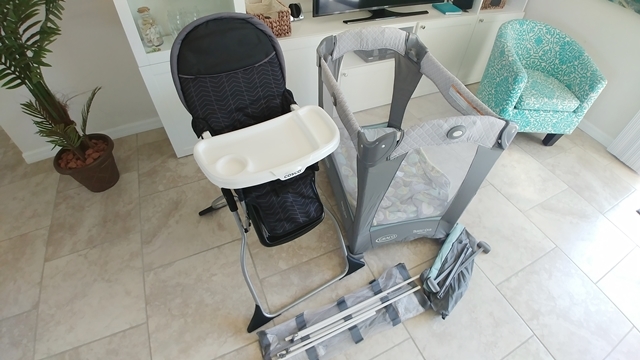 For families with children, South Venice is just perfect. 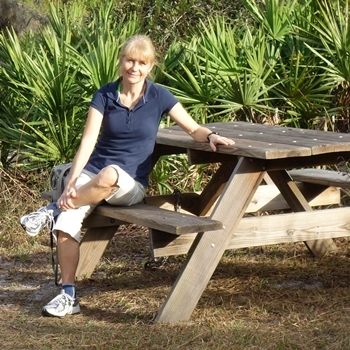 The wonderful weather all year round and the child-friendly environment of Florida make traveling a pleasure. 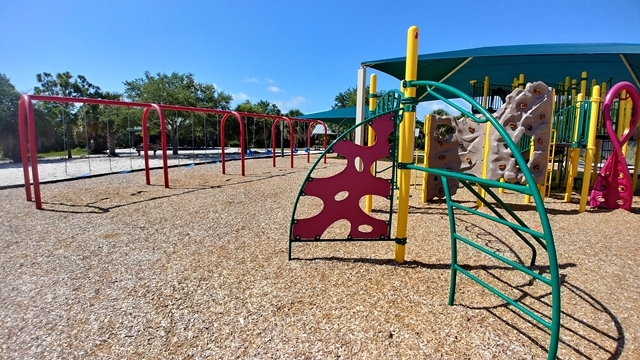 From the child-friendly equipment of your vacation home – high chair, bed railing, pool fence, games for young and older children, books and DVDs, pool and sand toys – to the many destinations for families such as nature parks, museums, playgrounds and current events your stay with us is indeed pure family fun! Save your Preferred Dates Today! 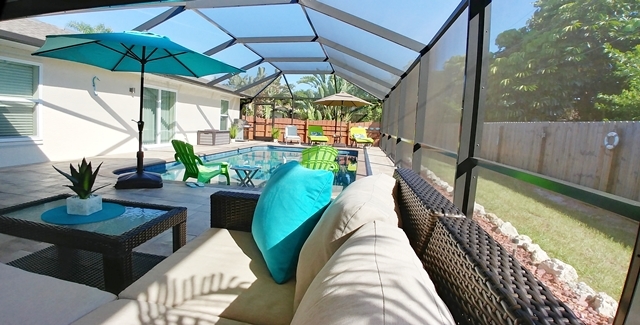 Check prices and especially convenient travel dates and secure your perfect period of time at your pool villa in Venice Florida today! Go to our calendar and see at a glance our available days for you. Contact us – either with email or phone – and get your offer today. For more photos please visit our page “Galleries“.